Our Mountain Laurel apartment is a great way to spend a few days or more away from the rush of your daily life. Hike right out to the network of trails and cliff lines in the Red River Gorge geological area. This apartment has two stories and a large porch. The covered porch has a table, chairs, and charcoal grill, perfect for reading, cooking, or listening to the nightlife! The first floor inside the apartment has a full kitchen, dining room table, and bathroom complete with blue slate bathtub and shower. Up the rustic stairwell, there are two large bedrooms with two beds (one queen one full size), dressers, and one television with a DVD player. There is also a window air conditioner unit in the larger bedroom. Our Mountain Laurel apartment is located in our main timber frame lodge building, 3546 Nada Tunnel Road, Stanton KY 40380. Nada Tunnel Road is also called St. Rt. 77 and is in the Red River Gorge geological area, just one mile past the historic railroad tunnel. 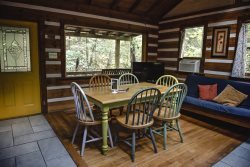 Staying in a Red River Gorgeous Cabin is truly a one-of-a-kind experience. Since all of our hand-crafted properties are unique, we wish to inform you of their individual features so you can come prepared to enjoy your stay to the fullest. Kitchen: Full kitchen complete with gas stove and oven, double sink, compact refrigerator, and coffee pot. Cookware, dishware, soap and cleaning linens are also provided. Living/Dining: Kitchen table for 4 and a loveseat. Mountain Laurel has its own private porch with patio seating as well. Bathroom: Full bathroom includes a sink, toilet and shower tub. Bedroom: Two bedrooms, one queen and one full bed with pillows. Additional Amenities: Weber charcoal grill, air conditioning, ceiling and box fans, electric space heater, and TV (DVD only).